You can’t always get what you want…but you can make lists about it. You can make multiple lists of wishes: one on your NOOK Tablet and one on BN.com. The most important difference between the two is that the NOOK Tablet’s WishList is only for downloadable files. The website list can include paper books and other items you want to have shipped to you, as well as eBooks, magazines, and newspapers that can be downloaded to the NOOK Tablet. You can visit from your NOOK Tablet, a desktop or laptop computer, or another web-capable device. Tap the cover to display details. Tap the WishList check box. Tap the My Account button. Tap the My WishList button. 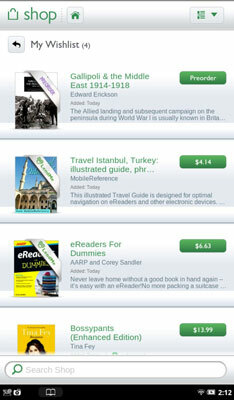 A list shows the cover, title, and price of each item, along with the date each was added to your list. To buy something on your WishList, tap the price button next to the item.